One of the most picturesque sights that we saw pretty much every day was the Koutoubia Mosque. Not being Muslim, we weren't allowed to go in, but it was fun to capture it from so many different angles when we spotted it from different parts of town. One of the secrets of excellent sight-seeing in Marrakech is taking carriage rides! We found that this mode of transport was typically no more expensive than a taxi, and so much more enjoyable! Of course, most of our sightseeing was done on foot. The photographic opportunities in the medina are really endless. So many colorful details! (I just added the rug photo below to my shop!). Early in my visit, we ended up doing some sightseeing with this random "tour guide" who chatted us up in the street. 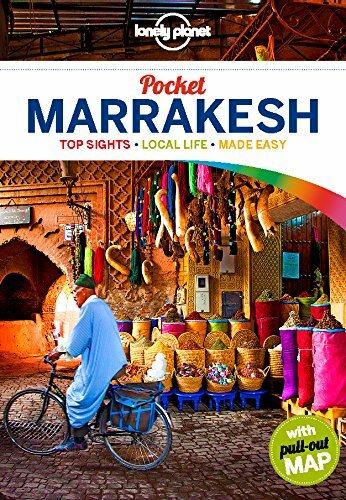 Turns out this is a thing in Marrakech: locals are super friendly and want to take you under their wing and show you all kinds of secret stuff... then they get a little huffy when you don't want to pay them as much money for this service as they ask for. As with our shopping adventures, I wasn't too comfortable with this whole arrangement, but Alex handled it like a pro. And it wasn't a total scam--we did get to see some sights way off the beaten path that we would never have found. In Marrakech, even the taxi drivers want to take you the places they recommend, regardless of whether you're really interested. I assume this is a matter of friends trying to drive business to each other, and while it seemed a little sketchy at first, it did result in some fun surprises. Most notably, one taxi driver dropped us off at this tannery. I don't think I knew this term before our trip; a tannery is the place where leather is made. We got to see all kinds of animal hides and all the pools of various dyes they were soaking in. And we were even given sprigs of mint to hold in front of our faces to mask the stench! Another of my favorite fun details to photograph: doors! Especially colorful ones, of course!